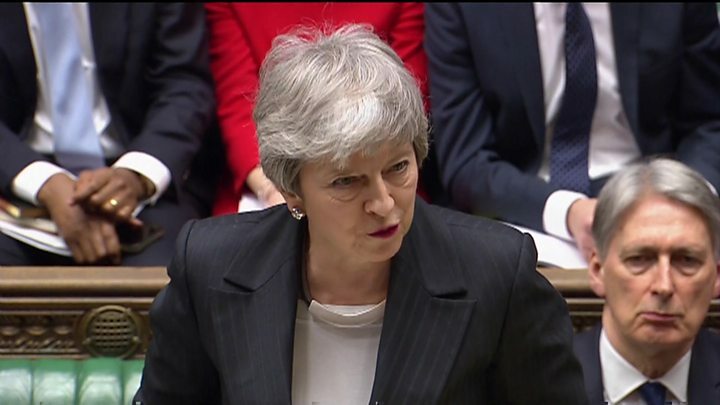 Media captionTheresa May: "I am not prepared to delay Brexit any further than 30 June"
The PM said it was "now time for MPs to decide" whether they wanted to leave with her deal, no deal or whether they chose not to leave at all - the latter, she warned, could cause "irreparable damage to public trust" in politicians. It's not me - it's them. The way it drowns out other public concerns, the way its processes, contradictions and clamour have wrapped their way around the normal workings of Westminster - remote at the best of times and downright bizarre at the worst. But, when it is MPs the prime minister needs to get on side if she is to have a real chance of finally getting her deal through next week - third time extremely lucky - the choice of message was not without risk. But Communities Secretary James Brokenshire said both the prime minister and the country feel "frustration" at not getting her deal through Parliament. He told BBC Newsnight: "She has been straight with the public, saying we need to not play games, not see the different subterfuges that we have experienced over last number of weeks, to actually crystallise this, to write this down, and make it real. "The fact is that we have a duty and a responsibility to give effect to that referendum and actually frame the choices and the consequences as well."